How can complementary therapies help my animal who is scared of loud noises? Many animals, from pets to livestock to wild animals will often experience fear from loud noises. 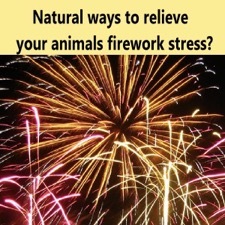 Typical noisy events which cause animals to be scared include fireworks around Guy Fawkes night, at New Year or other celebrations. Additionally thunderstorms can cause anxiety, and bird scarers can be very loud, and shock or surprise many horses hacking, or dogs being exercised in the countryside. If possible, it’s a good idea to plan ahead to help minimise any fear that your animal may experience - for example, with fireworks around Guy Fawkes night can you find out if any are to be used in your local area for bonfire parties? Although this isn't always possible to know, if you do, then you can take more specific preventative action to help your horse, dog or other animal avoid being frightened. Also, do your neighbours know that you keep animals and appreciate the fear that they may experience from the noise, and so that letting you have advance notice of when fireworks will be used would be helpful? As well as there being “conventional” treatments to help provide a relaxing effect to animals, there are also several complementary therapies that may successfully help in reducing fear and/or minimising the symptoms. Here is a summary of some of the more natural approaches that can be used to assist a wide range of animals to cope with the fear of loud noises. Many complementary therapies can be used with a range of animals to help prevent/reduce fear - from pets to livestock to birds and even reptiles. If you would like specific advice for your animal, then do contact your Veterinary Surgeon. It is possible to buy Bach Flower Remedies, Homeopathic tablets & Herbal Remedies from good saddlers/animal feed merchants for your own personal use with your animals. But as with all complementary therapies for animals, seeking veterinary advice is always advised and gaining the consent of your veterinary surgeon is necessary in many instances. A professionally trained therapist will always work in conjunction with your vet anyway, in order to ensure that your animal achieves maximum results from the treatment. Create a "den" or other "safe space" in your home - In advance of when you expect the noisy event to happen, let your pet have an area in the house where s/he can feel safe and secure. This could have some of his or her favourite toys there, or a extra-comfy blanket to help create comfort. Distract your pet with toys or treats or play. For your horse or pony, this could be a treat-ball in his or her stable. Be calm yourself - if you don't react to the noise, then it may help your animal feel that there isn't anything too bad to worry about. Have a radio or TV on (whether in the home, stable or barn), - the sound of TV or radio can be a distraction and a comfort to an animal who's frightened of loud noises. Don't scold or be upset with your animal - if s/he is stressed, be calm and don't make an issue of the situation, as it may lead to resentment and definitely more stress!